Projects — A new system for managing R projects that enables easy switching between working directories and per-project contexts for source documents, workspaces, and history. Code Navigation — Typeahead navigation by file or function name (Ctrl+.) and the ability to navigate directly to the definition of any function (F2 or Ctrl+Click). Version Control — Integrated support for Git and Subversion, including changelist management, diffing/staging, and project history. 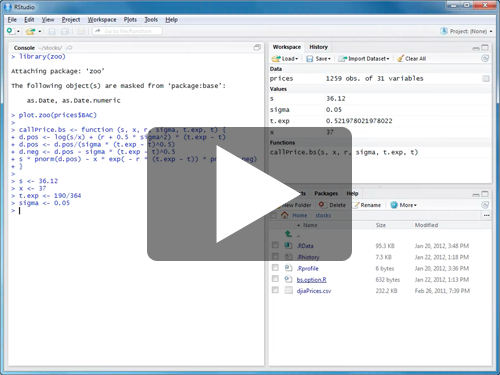 There is also an interview with RStudio founder JJ Allaire over on DecisionStats that has a more in-depth discussion of the release and the RStudio project in general. The evolution of RStudio is a direct result of the many in-depth conversations we’ve had with users at meetups, conferences, and on our support forum. We realize that there’s plenty more to do and hope we can keep up with all of the great feedback! In that spirit we hope to see lots of folks this Thursday night at the Chicago RUG meetup as well as in February in Houston and Los Angeles.